Relenting to pressure from the media and government, Tokyo Electric Power (Tepco) has released 150 hours of video footage taken inside its command centres during last year’s devastating accident at the Fukushima Daiichi nuclear plant. “The impression is one of confusion, disorganisation and intense strain,” reports Japan Realtime. The clips show tense exchanges as officials struggled with the unfolding disaster after the tsunami on March 11, 2011, damaged the power system for cooling the plant, which then went through meltdowns and explosions. The videos contradict previous assertions by Tepco and show that executives knew early in the crisis that reactor no 2 had gone into meltdown. But they hesitated before using corrosive seawater to cool it. 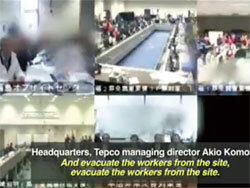 The clip also touches the most controversial aspect of the accident—Tepco at one point was probably planning to evacuate its workers, abandoning the plant to a catastrophic meltdown. The Japanese media have complained about the limited disclosure of the videos, which are grainy and mostly without sound. It is available for viewing only by select journalists who cannot record it. Korea Herald says such partial disclosure will only feed suspicion that Tepco is covering up crucial information.